Not to be confused with Adema. "Dropsy" redirects here. For other uses, see Dropsy (disambiguation). Edema, also spelled oedema or œdema, is an abnormal accumulation of fluid in the interstitium, located beneath the skin and in the cavities of the body, which can cause severe pain. Clinically, edema manifests as swelling. The amount of interstitial fluid is determined by the balance of fluid homeostasis and the increased secretion of fluid into the interstitium. The word is from Greek οἴδημα oídēma meaning "swelling". The condition is also known (mostly archaic) as dropsy. Cutaneous edema is referred to as "pitting" when, after pressure is applied to a small area, the indentation persists after the release of the pressure. Peripheral pitting edema, as shown in the illustration, is the more common type, resulting from water retention. It can be caused by systemic diseases, pregnancy in some women, either directly or as a result of heart failure, or local conditions such as varicose veins, thrombophlebitis, insect bites, and dermatitis. Non-pitting edema is observed when the indentation does not persist. It is associated with such conditions as lymphedema, lipedema, and myxedema. Edema caused by malnutrition defines kwashiorkor, an acute form of childhood protein-energy malnutrition characterized by edema, irritability, anorexia, ulcerating dermatoses, and an enlarged liver with fatty infiltrates. A rise in hydrostatic pressure occurs in cardiac failure. A fall in osmotic pressure occurs in nephrotic syndrome and liver failure. Causes of edema which are generalized to the whole body can cause edema in multiple organs and peripherally. For example, severe heart failure can cause pulmonary edema, pleural effusions, ascites and peripheral edema. Such severe systemic edema is called anasarca. In rare cases, a Parvovirus B19 infection may cause generalized edemas. Although a low plasma oncotic pressure is widely cited for the edema of nephrotic syndrome, most physicians note that the edema may occur before there is any significant protein in the urine (proteinuria) or fall in plasma protein level. Most forms of nephrotic syndrome are due to biochemical and structural changes in the basement membrane of capillaries in the kidney glomeruli, and these changes occur, if to a lesser degree, in the vessels of most other tissues of the body. Thus the resulting increase in permeability that leads to protein in the urine can explain the edema if all other vessels are more permeable as well. As well as the previously mentioned conditions, edemas often occur during the late stages of pregnancy in some women. This is more common with those of a history of pulmonary problems or poor circulation also being intensified if arthritis is already present in that particular woman. Women that already have arthritic problems most often have to seek medical help for pain caused from over-reactive swelling. Edemas that occur during pregnancy are usually found in the lower part of the leg, usually from the calf down. An edema will occur in specific organs as part of inflammations, tendonitis or pancreatitis, for instance. Certain organs develop edema through tissue specific mechanisms. Pedal edema (dependent edema of legs) is extracellular fluid accumulation in the legs. This can occur in otherwise healthy people due to hypervolemia or maintaining a standing or seated posture for an extended period of time. It can occur due to diminished venous return of blood to the heart due to congestive heart failure or pulmonary hypertension. It can also occur in patients with increased hydrostatic venous pressure or decreased oncotic venous pressure, due to obstruction of lymphatic or venous vessels draining the lower extremity. Certain drugs (for example, amlodipine) can cause pedal edema. Cerebral edema is extracellular fluid accumulation in the brain. It can occur in toxic or abnormal metabolic states and conditions such as systemic lupus or reduced oxygen at high altitudes. It causes drowsiness or loss of consciousness, leading to brain herniation and death. Pulmonary edema occurs when the pressure in blood vessels in the lung is raised because of obstruction to the removal of blood via the pulmonary veins. This is usually due to failure of the left ventricle of the heart. It can also occur in altitude sickness or on inhalation of toxic chemicals. Pulmonary edema produces shortness of breath. Pleural effusions may occur when fluid also accumulates in the pleural cavity. Edema may also be found in the cornea of the eye with glaucoma, severe conjunctivitis or keratitis or after surgery. Sufferers may perceive coloured haloes around bright lights. 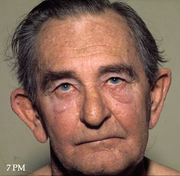 Edema surrounding the eyes is called periorbital edema or eye puffiness. The periorbital tissues are most noticeably swollen immediately after waking, perhaps as a result of the gravitational redistribution of fluid in the horizontal position. Common appearances of cutaneous edema are observed with mosquito bites, spider bites, bee stings (wheal and flare), and skin contact with certain plants such as Poison Ivy or Western Poison Oak, the latter of which are termed contact dermatitides. Another cutaneous form of edema is myxedema, which is caused by increased deposition of connective tissue. 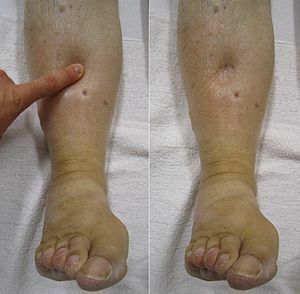 In myxedema (and a variety of other rarer conditions) edema is caused by an increased tendency of the tissue to hold water within its extracellular space. In myxedema this is because of an increase in hydrophilic carbohydrate-rich molecules (perhaps mostly hyaluronin) deposited in the tissue matrix. Edema forms more easily in dependent areas in the elderly (sitting in chairs at home or on aeroplanes) and this is not well understood. Estrogens alter body weight in part through changes in tissue water content. There may be a variety of poorly understood situations in which transfer of water from tissue matrix to lymphatics is impaired because of changes in the hydrophilicity of the tissue or failure of the 'wicking' function of terminal lymphatic capillaries. In lymphedema abnormal removal of interstitial fluid is caused by failure of the lymphatic system. This may be due to obstruction from, for example, pressure from a cancer or enlarged lymph nodes, destruction of lymph vessels by radiotherapy, or infiltration of the lymphatics by infection (such as elephantiasis). It is most commonly due to a failure of the pumping action of muscles due to immobility, most strikingly in conditions such as multiple sclerosis, or paraplegia. It has been suggested that the edema that occurs in some people following use of aspirin-like cyclo-oxygenase inhibitors such as ibuprofen or indomethacin may be due to inhibition of lymph heart action. Hydrops fetalis is a condition of the fetus characterized by an accumulation of fluid, or edema, in at least two fetal compartments. changes in the water retaining properties of the tissues themselves. Raised hydrostatic pressure often reflects retention of water and sodium by the kidneys. Generation of interstitial fluid is regulated by the forces of the Starling equation. Hydrostatic pressure within blood vessels tends to cause water to filter out into the tissue. This leads to a difference in protein concentration between blood plasma and tissue. As a result, the colloidal or oncotic pressure of the higher level of protein in the plasma tends to draw water back into the blood vessels from the tissue. Starling's equation states that the rate of leakage of fluid is determined by the difference between the two forces and also by the permeability of the vessel wall to water, which determines the rate of flow for a given force imbalance. Most water leakage occurs in capillaries or post capillary venules, which have a semi-permeable membrane wall that allows water to pass more freely than protein. (The protein is said to be reflected and the efficiency of reflection is given by a reflection constant of up to 1.) If the gaps between the cells of the vessel wall open up then permeability to water is increased first, but as the gaps increase in size permeability to protein also increases with a fall in reflection coefficient. Changes in the variables in Starling's equation can contribute to the formation of edemas either by an increase in hydrostatic pressure within the blood vessel, a decrease in the oncotic pressure within the blood vessel or an increase in vessel wall permeability. The latter has two effects. It allows water to flow more freely and it reduces the colloidal or oncotic pressure difference by allowing protein to leave the vessel more easily. Vein obstruction causes facial edema while lying down to sleep. After being upright all day, the swelling disappears. When possible, treatment involves resolving the underlying cause. Treatment may also involve positioning the affected body parts to improve drainage. For example, swelling in feet or ankles may be reduced by having the person lie down in bed or sit with the feet propped up on cushions. Intermittent pneumatic compression can be used to pressurize tissue in a limb, forcing fluids—both blood and lymph—to flow out of the pressurized area. ^ Renkin EM (1994). "Cellular aspects of transvascular exchange: a 40-year perspective". Microcirculation. 1 (3): 157–67. doi:10.3109/10739689409148270. PMID 8790586. ^ Wiggli B, Imhof E, Meier CA, Laifer G (2013). "Water, water, everywhere. Acute parvovirus B19 infection". Lancet. 381 (9868): 776. doi:10.1016/S0140-6736(12)61894-7. PMID 23472922. ^ Palmer BF, Alpern RJ (1997). "Pathogenesis of edema formation in the nephrotic syndrome". Kidney Int. Suppl. 59: S21–7. PMID 9185099. ^ Kumar; Abbas; Fausto (1999). Pathologic Basis of Disease (7th ed.). Elsevier Saunders. p. 122. ISBN 0-7216-0187-1. ^ Boron W.F., Boulpaep E.L. (2012.) Medical Physiology: A Cellular and Molecular Approach, 2e. Saunders/Elsevier, Philadelphia, PA.
Wikimedia Commons has media related to Edema.